Kent County Council is looking for contractors for an £18m highways resurfacing job. Eurovia Infrastructure and Tarmac have signed contracts to carry out £18m worth of highways resurfacing in Kent. Kent County Council is the latest local authority to introduce lane rental charges for utility contractors who disrupt traffic. Highway improvements worth £2.3 million will be implemented in East Kent after the county council received local pinch point funding. A scheme that will see extra capacity added to the M25 on the Kent/Surrey border is about to move to a new phase. Highways crews across Kent are working to improve the standard of the county’s roads. A scheme designed to reduce congestion on Kent’s busiest roads has helped save more than £4 million in its first year of operation. A scheme to build junction 10a on the M20 in Kent has been given the go ahead after receiving government funding. The government has ordered an urgent review into the resilience of the road network in East Kent after five-hour delays and long queues on the M20 caused major disruption for motorists this week. Sections of the M20 in Kent now have improved skid resistance after a system from Klaruw was used on the motorway. The Freight Transport Association (FTA) has called on the French government to end the chaos in Calais after ferry workers threatened a second week of cross-Channel disruption. Roads Minister Andrew Jones visited Maidstone in Kent last week in an effort to find a solution to Operation Stack. The government has announced that Manston Airport will be temporarily used as an alternative for freight traffic when Operation Stack is in place on the M20. Highways England has revealed plans for a new lorry park in Kent to ease the disruption caused by Operation Stack. Highways England has received almost 30,000 online responses to a consultation on proposals for a multi-billion pound road link across the River Thames. Balfour Beatty has been awarded a £130 million contract to construct a 3,600-space lorry park near the M20 in Kent to relieve congestion during Operation Stack. 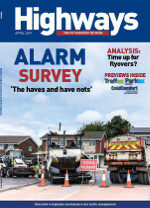 A-one+ has started work on a Highways England contract that is worth up to £70 million per year in Kent and Sussex. The collapse of a pedestrian footbridge on the M20 in Kent caused the closure of the motorway over the bank holiday weekend. Highways England successfully reopened the M20 in Kent ahead of schedule following the removal of a section of footbridge that was damaged after being hit by a digger on a lorry the previous weekend. Plans to build a new £70 million junction on the M20 at Ashford in Kent have moved a step closer to becoming a reality. Chris Sheppard has been named as general manager for A-one+ in Highways England Area 4 which covers Kent, Surrey, East and West Sussex. Vinci has been awarded a £39.1 million contract to construct a new junction on the M20 near Ashford in Kent. 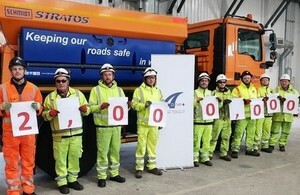 Roadworkers on motorways and major A roads in Kent and Sussex have achieved more than two million hours without an accident.